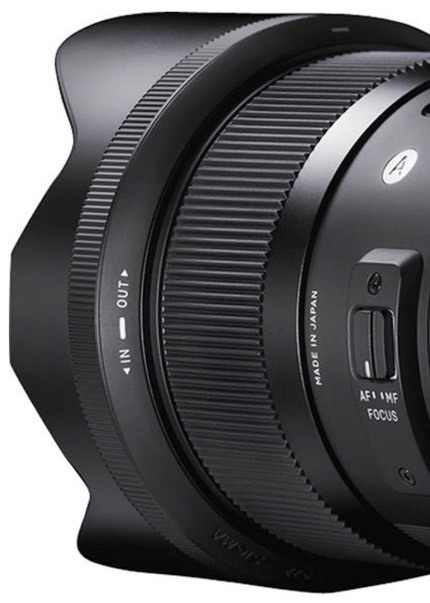 The Sigma 18-35mm f/1.8 DC HSM Art lens is an anomaly in the zoom lens market: a seriously fast-aperture, crop-sensor lens with a limited focal length range. Remember, the DX bodies are at about a one-stop disadvantage to the FX bodies, all else equal. So wouldn't we all love a set of f/2 DX zooms to offset that disadvantage so that we can continue to shoot DX? The 20mp D5/D500 combo really hammers home this point. Bear with me, we have to talk about cameras a bit to understand why this lens is important. With the D5 and the 24-70mm f/2.8E you have a massive combination that weighs in at 89 ounces (2475g). With the D500 and the Sigma 18-35mm f/1.8 you have a much smaller and lighter 58.9 ounces (1670g) combo. The 18-35mm is 28.6 ounces (811g) of that. Of course, all is not equal still, as the Sigma is 18-35mm, which is really 27-52mm effective. So we're missing the 24mm and 70mm ends of the zoom. Still, if you're mostly shooting 28mm, 35mm, 50mm types of imagery, this Sigma is going to give you what you want. Let's look around the lens a bit. This is a Sigma Art lens, meaning a high degree of optical and physical refinement that is professional in grade. We've got four aspherical elements in this lens as well as five special low dispersion elements, so nine of the 17 elements have some special glass component to them, plus we have Sigma's usual Super Multi-Layer coating to reduce reflections from all that glass. The maximum aperture is a constant f/1.8, which is something new for zoom lenses, particularly DX ones, with a minimum aperture of f/16. The aperture diaphragm itself is the usual nine-blade rounded design. Minimum focus distance is 11 inches (28cm), with a maximum magnification ratio of 1:4.3. Not quite macro range, but certainly close enough focus for the types of shooting you're likely to do with this lens. Up front we have a 72mm filter ring and an included bayonet lens hood. The lens itself isn't small, being almost five inches long before you put the hood on (121mm), and it's a fairly constant 3+" (78mm) in diameter from stem to stern. The LH780-06 lens hood is a deep petal design, adding another 2" or so to the length. Strangely, it's marked "In -- Out" instead of "On -- Off" or something more suitable. The zoom ring is marked at 18, 20, 24, 28, and 35mm, and is the ring nearest the camera body. It turns from minimum focal length to maximum in less than a quarter turn. As you might note from those numbers and the short ring turn, a lot of the focus throw on this lens deals with the near space (1-6' or 0.28-2m). Focus discrimination by focus ring for longer distances is a little short on ring rotation (though the lens does go substantially beyond infinity, as do most lenses with low dispersion glass to allow for temperature variations). Both focus and zooming are internal. The lens does not change in size nor does the front element rotate during any changes. There's only one switch on the lens, which controls whether the lens is in autofocus or manual focus mode. Sigma makes a bit of noise about the thermal nature of the lens barrel: it's made of a TSC compound material that is durable but resistant to temperature and the environment. What that means is that the barrel is not metal, though the texture of the material may make you think it is. The 18-35mm is available in Nikon F, Canon EF, Sigma SA, Pentax K, and Sony Alpha mounts, and is made in Japan. As with all Sigma Art lenses, this lens is compatible with the Sigma USB Dock for focus tuning and software updates. Also, you can have Sigma convert your lens from one mount to another for an additional fee. Price of the lens is US$799, and it is made in Japan. Versions are available for the Canon EF-S, Nikon DX, Pentax K, Sigma SA, and Sony Alpha mounts. Source of the review lens: purchased from dealer stock. The zoom ring on my lens is very stiff and resistant to turning. That doesn't bother me at all, as it is smooth when you do exert enough force on it, but tends to stay where you leave it. The focus ring is another story. Doing focus overrides while in autofocus mode the ring is a bit grabby on my sample. In manual focus mode the ring is very smooth, but there's a distinct rubbing sound in the middle of the focus range that's annoying. Curiously, that rubbing sound never occurs in autofocus. While the lens hood has a nice grip texture ring to help you mount and unmount it, my sample is extremely tight and rough in this respect. The good news is that the hood stays on, the bad news is that I have to pay some attention and have a good grip to get it off. As with the 50-100mm f/1.8, there's the odd marking for positioning the hood for putting it on, and the odd markings for taking it off (In/Out). Still, there's nothing truly problematic about the lens handling. It's very appropriately sized for DX bodies and the rings definitely avoid the annoying tendency of some lenses to slip quickly from where you set them. Autofocus: The HSM motor in this zoom is fast. Faster than most of the Nikkor AF-S primes and a few of the AF-S zooms. The lens tracks well with moving subjects, and it tends to snap to focus, even across a big leap of distance. But there are two things you need to know about this lens and autofocus, one very minor, one major. The minor issue is that the lens is a little more jittery on stationary objects than my Nikkors, which just tend to stay in one focus position. The Sigma doesn't move much, but you will hear it making faint adjustment sounds at times it probably shouldn't be. Fortunately, as I noted, the focus motor is fast, so I've never caught this as producing an unsharp shot. The major issue has to do with the D500, the most likely camera you'd stick this lens on. In the central selectable autofocus sensors (for sure the most central 9 and as far as I can tell the full central 25) there's no issue at all. The lens focuses as you'd expect. However, if you rely on the selectable autofocus sensors to the left and right edges—the outer 30—you're going to get misfocused images. This appears to have to do with physical limitations with the phase detect array. Since Nikon has pushed the array so wide with such small individual sensors, the far-edge sensors have issues seeing the full data from some really fast lenses. This wasn't true with the Sigma 50-100mm f/1.8, but is true of the Sigma 18-35mm f/1.8, and that probably has to do with the angle the light is coming off the rear elements. In practice, this means on a D500 with the 18-35mm f/1.8 you probably need to avoid Auto, 3D, and Dynamic 153 autofocus settings, and try to keep your selected cursor in the center three columns for Dynamic 72, and in the center five columns for Dynamic 25 and Group AF. Also, don't use Single area outside the central 25 selectable areas. For the types of shooting I've been using the 18-35mm for, this hasn't been limiting, but it does pose problems for those who want to focus well off center. Note that I didn't have this issue with the D7200, and I wouldn't expect it with the D3xxx and D5xxx cameras, either. Sharpness: In the center this lens is what I’d consider sharp. It’s very good at f/1.8, excellent at f/2.8 to f/5.6. 18mm is the strongest focal length by a bit across the whole frame, with 35mm being the weakest by a bit, at least up through about f/5.6 where everything looks about the same. Edge of frame is a bit of a different story. You really have to stop down to f/4 to get to what I might call very good corners. Faster than that the corners are only good. Curiously, the corners flop from being better at 18mm and f/1.8 than at 35mm and f/1.8, to being worse than 35mm at f/4 and staying that way. Not a big difference, but not one that I was expecting given the central performance. Overall, this lens has to be considered optically very good, but it’s not as edge-to-edge sharp as most recent full frame Nikkors have been. This Sigma is more like traditional lenses where the corners are weaker than the center at all apertures. This lens has no substantive focus shift, though it may have a very slight bit of field curvature, particularly at the long end. Astigmatism and coma are relatively well correctly, especially for a fast zoom lens. Aberrations: There’s minimal but visible longitudinal chromatic aberration at f/1.8. Far better performance than one would expect from a very fast zoom, but still in the realm where you’re going to want to be careful about using f/1.8 on some high-contrast subject matter without correction. Lateral chromatic aberration is clearly visible and needs correction in the lower range of the zoom, not so much at the higher end. 24mm turns out to be the worst offender, with 18mm not far behind. You’ll want to correct results from those focal lengths. But 35mm is down to levels that are ignorable, especially wide open, which was surprising. Linear Distortion: You’ll want to pay attention here. There’s clear barrel distortion of almost 2% at the wide end, clear pincushion distortion at the long end of a bit over 1%. I think you’ll want to correct both the extremes. Midway at 24mm there’s nothing to correct, basically. Vignetting: As expected, wide open there’s clear vignetting of about 1.3 stops, and that’s pretty much gone by f/4. When the lens vignettes, it does so quickly in the corners, less so from the central area. On an FX body there's a strong boxed cutoff with top center and bottom center arcs visible at 18mm. By 24mm, the lens is probably usable on FX bodies with the 5:4 crop. At 35mm the full frame is rendered, though vignetting is still substantive. Flare: Like its twin, the 50-100mm f/1.8, the 18-35mm f/1.8 has one potentially fatal flaw: very clear and annoying flare patterns, both with the light source in frame as well as when the light source is just out of frame. This is not a contre jour shooter’s lens: don’t shoot into the sun with it unless you enjoy green and magenta lens reflection echoes. Lots to like and a few things to ponder with the 18-35mm f/1.8 Art. Optically, it performs far better than you'd ever expect a cropped image circle f/1.8 zoom to perform. Far better. It's sharp enough to pass for a reasonable prime, though the extreme corners do tend to be a bit weaker. Since Nikon hasn't gotten around to making an 18mm f/1.8 DX prime (or a 24mm one), here we have the 28mm, 35mm, and 50mm equivalent primes all wrapped into one larger package, and performing optically about as we would hope for a fast DX prime. That's the great news. The less-great news is that we can't get to 24mm equivalent. That change alone would have made this lens a "must have" for every DX shooter. Because we're starting out near 28mm equivalent instead, you can't quite say that the 18-35mm f/1.8 Art truly subs for a wide angle to telephoto zoom. It's really a slightly wide to normal zoom. And that's going to bother some, as the overall focal range covered by this lens is somewhat small. The other thing that's going to bother some is that they want to put it on a D500, where the autofocus issue I described means that you have to restrict the camera to the central areas for focusing. I've dealt with a number of folk who've just started shooting with this lens on a D500 and have been disappointed with their results until we restricted their autofocus sensor usage. So the 18-35mm f/1.8mm is not a perfect lens. The question is whether it's good enough that you should have it in your bag. My answer to that is a very loud probably. Many event shooters are not going to like the 18mm lower focal length limit, I think, and they're going to be bummed when they have to avoid certain focus settings on their D500. For me, however, the 18-35mm f/1.8 is often on my D500 body, and I just live with its limitations because the optically quality is there, and it gives me back that stop I'm losing compared to my D5 and the 24-70mm f/2.8E, at least in the equivalent focal range. At US$799 I'd say that it's very appropriately priced for what it does. And what it does is give you a 28mm, 35mm, and 50mm equivalent prime level of quality, and at f/1.8. Given Nikon's neglect of the DX lens line, the Sigma 18-35mm f/1.8 Art is filling in some of the gaps with just one lens, though with a somewhat bigger lens than the primes would be. Though then again, three prime spaces in my bag would probably take up more room than the Sigma does. I like the Sigma 18-35mm f/1.8 Art, and it's staying in my bag until something better comes along. What did it kick out? Well, the Sigma 17-50mm f/2.8 and the Nikkor 16-80mm f/2.8-4. Most of the time. Some of the time I need the 16mm of the latter. But if I need the long end of mid-range, I just put on the Sigma 50-100mm f/1.8 Art, which is also now in my DX bag. And that's where I ended up liking the Sigma: when the matching 50-100mm f/1.8 Art showed up, the two f/1.8 Sigma lenses pretty much solved my 28-150mm equivalent focal lengths for DX. Stick the Tokina 11-20mm f/2.8 in for the wide end, and then something for long reach (say the 300mm f/4), and I've got a very competent DX bag. And it's not all that big a bag nor is it particularly heavy.